Among Florence museums, the Opificio delle Pietre Dure (Semi-precious Stones Workshop) is dedicated to the fascinating traditional art of the Florentine Mosaic (or inlaid work) in semi-precious stones. The Medici family brought to new life this ancient art, that was already known by the Egyptians, Greeks and Romans. Florentine craftsmen have skilfully worked for centuries with naturally coloured stones (quartz, chalcedony, jasper, lapis-lazuli), fitting them together to realize impressive architectural decorations and precious artifacts. The workshop was officially founded in 1588 by Ferdinando I de\' Medici, with the purpose of decorating the Chapel of Princes, the Medici Mausoleum, under the direction of masters such as Bernardo Buontalenti, Matteo Nigetti and Pietro Tacca. At first it was located in the Casino Mediceo, then at the Uffizi and in 1796 in the present site. 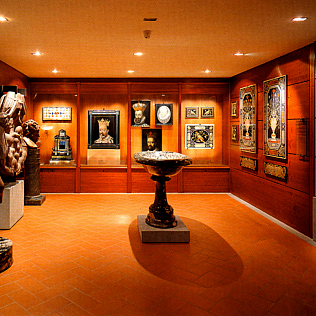 The museum in Florence, created next to the workshop, was opened in the late 19th century when the Opificio started to attend to artworks restoration, and it has been fully renovated and enlarged in 1995 with an educational section. The Opificio houses a big collection of semi-precious stone works (the so called “Florentine Mosaic”), fascinating real \"stone paintings\" as portraits, abstract decorations and landscapes, together with an important section of natural and floral subjects (very fashionable between the 17th and 18th century) and mural decorations, small sculptures, cameos, cabinets and other pieces of furniture, decorated with ebony and gilded bronze. The section dedicated to the Laboratory displays work tools and samples of the most precious stones used by the craftsmen.